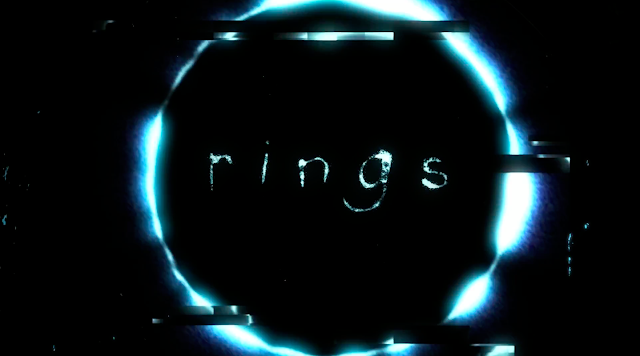 RINGS tells a unique story and I liked it. So I saw Rings tonight. First thought: it was much better than The Ring Two, which, A: was just as I predicted, and B: which wasn't very hard to do in the first place. So where does it stack up compared to the 2002 film? Not quite as a good and less than half as scary. But, and this is a big but, I enjoyed the story quite a bit. I took to Twitter shortly after seeing the movie made mention that this film felt more like a mystery/drama/suspense film than a horror movie. And I think a lot of you will share that same sentiment. Normally I'd be 100% okay with this -- seeing as I'm not much of a gore-hound anyway. But this is The Ring for crying out loud! The first movie was hailed by many critics as one of the scariest movies of all time. So it's a little disheartening to see that Rings didn't pack much of a punch. The first act of the movie does an excellent job of setting up the events for the movie and even manages to make VCRs semi-relevant again. I really liked how some elements from the short film of the same name seem to appear in this film as well. The short dealt with a cult of tape-watchers and this movie plays with the idea of it being an underground college experiment of the same nature. One thing that I definitely applaud this movie for was its ability to successfully tell a prequel story while remaining in present day and being a second sequel. So kudos to director F. Javier Gutierrez and company on a job well-done in that aspect. Also, like myself, many of you will find the final confrontation at the end to have a pretty rewarding payoff (albeit with an out-of-left-field suspension). Overall, I liked it and recommend it to any fan of the Ring series. Hey, I kept this review pretty short. I'm tired. Sue me.